Hear ye hear ye all you old farts, all of you jackasses, all of you oldies who fall under Blake Shelton’s ire for only wanting to listen to grandpa’s music. 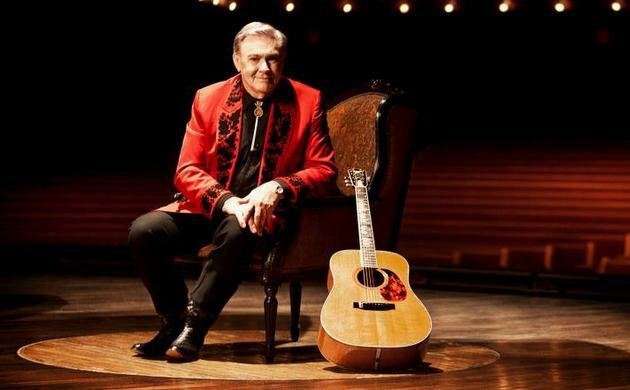 Jim Ed Brown, the country music legend and Grand Ole Opry icon, known fondly for much of his career as a member of the family band The Browns, has released his first solo record in over 40 years, and he beat lung Cancer to do it. So you best listen, and listen good. The news came down in September 2014 that Jim Ed Brown had received the Cancer diagnosis after he’d missed a few weeks of engagements. But you wouldn’t have known anything was wrong before then. At 80-years-old, Jim Ed Brown made a whopping 50 appearances on the Grand Ole Opry in 2014, making him one of the most frequent performers on the show, all while taking in other touring engagements, and conducting his syndicated Country Music Greats Radio Show, and recording this album. No, there’s no signs of Jim Ed slowing down anytime soon, and almost like it was part of a divine plan, at the same time Jim Ed released In Style Again through Plowboy Records, the word came down that his Cancer was in remission. There’s just something so cozy about Jim Ed Brown’s music, even more so than from most country artists of an advanced age. The fact that his style hasn’t really changed at all since the late 50’s isn’t something that holds it back, it’s what makes it endearing. Jim Ed’s music is like the pipe smoke and pies baking smell of your grandparents house; like the simple pleasure of a hard candy. There’s just something about the familiar and the expected that’s reassuring, and that’s why Jim Ed Brown has endured as an entertainer across multiple generations. There’s a message to this new album In Style Again, however subtle. It’s one of self-awareness and reflection, reinforced by the title and cover photo. There’s Jim Ed sitting at a dinner table amongst all this anachronistic finery that feels so dated, including a salt and pepper shaker made as little replicas of the RCA dog—a call back to Brown’s once long-tenured record label—yet there’s this proclamation about being “In Style Again.” It’s a little bit of genius quietly delivered. Though Jim Ed touches on many subjects, the songs “In Style Again,” “Older Guy,” and “Am I Still Country?” seem to set the theme of the record of an older artist being passed on by, but grinning coyly from the wisdom of how learning to slow down is one of the virtues in life, as the younger artists rush past in a bid to be a part of the here and now. “Am I Still Country?” could almost be considered a country protest song in its own playful way. “I don’t have a tattoo or wear an earring, my sweet mama don’t wear skin tight jeans…,” While “In Style Again” could equally allude to a lover, or the music industry. In Style Again is a good mix of some fairly well-known covers like Bill Anderson’s “Lucky Enough” and the old standard “Don’t Let Me Cross Over,” and a lot of newer songs written by Don Cusic who also produced the effort. There’s also some great love songs here like “I Love It” and “Laura (Do You Love Me).” The vocals are the centerpiece of In Style Again, and notable harmony contributors include Vince Gill, sister Bonnie Brown on the excellent opening number “When The Sun Says Hello the the Mountain,” and The Whites who lend their voices to various tracks. Bobby Bare also produced the title track of the record. What new school fans don’t understand about old school country music is that it can be such a catalyst for memory, enhancing the listening experience beyond the enhanced value of the music itself. 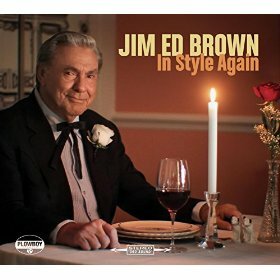 Jim Ed Brown and In Style Again embody this notion in the truest sense, and make for warm, enjoyable moments that leave you happy even when the music stops. Eddie Stubbs did a wonderful interview this week w/JEB on wsmonline.com which should be in their online streaming archive, worth a listen. This is great. Thanks for the write-up, Trig. Man, his voice hasn’t aged a day. Excellent. I was hoping you would review this, Trig, and this was a great write-up. The comments about the pipe tobacco and pie-baking vibe remind me of similar comments I believe you made about one of Don Williams’ recent efforts, and I think the comparison is apt. The couple of tracks I’ve heard from this album so far sound very nice. There is something so smooth and effortless about Jim Ed Brown’s vocal style that I love; it’s as if he doesn’t have to *try* very hard when he sings, and I mean that in a good way. I’m also glad to see that this album was produced by Don Cusic. Judging from his books, it seems like that guy has a near encyclopedic knowledge of country music, and I’ve enjoyed other projects he produced, such as Bobby Bare’s most recent collection. Last weekend marked Jim Ed Brown’s return to the Grand Ole Opry stage for the first time since the four month leave of absence that followed his cancer diagnosis. It was truly a special occasion. Jim Ed appeared on both on Friday and Saturday nights, and received a rapturous standing ovation both nights. I got to listen on Saturday and it was a real treat. Mr. Brown said he hadn’t sang anything in four months, but for an eighty year old man just returning from lung cancer treatment, he sounded absolutely terrific. Maybe a little hoarse, if anything, but his vocals were still smooth. Apparently, Friday night was really emotional as he performed “The Three Bells” for the first time back, and as anyone who’s familiar with the song knows, it is like a prayer in and of itself. On the night I was listening he sang “Pop A Top” in addition to “In Style Again” from his new CD. Unfortunately, he forgot some of the words to the new song, and had to improvise a little with lines like “I should have learned the words to my song before I sang it, la la la la”, but he recovered like a pro, and the audience loved it anyway. He also stayed late to sign CDs in the lobby. What a great guy. I believe both shows can be streamed from the archive section of the WSM website. On a side note, the Opry has really been on the ball so far in 2015 in terms of putting together good shows, and I hope they can keep it up. The show I listened to also had Jamey Johnson, Del McCoury Band and Ricky Skaggs, plus the Whites and other regulars. Besides Jim Ed’s performance, the best moment of the night was when Ricky Skaggs invited Del McCoury back out onstage to sing a duet on “Goin’ Back to Ol’ Kentucky,” followed by a impromptu version of “Uncle Pen” to end the show. Good stuff! I was at the Friday nights Opry and got to see him preform along with many others. For my first experience in Nashville and at the Opry it was one heck of a show. Off topic does anyone else notice how modern rock radio will play the classics too while country radio won’t play anything over 10 years old? That’s because modern rock is dead as a radio format, so they have to bolster their rotations with older music. Ironically, this is what mainstream country radio used to be, where it wasn’t unheard of to hear a 20-year-old song during afternoon drive. Now it’s virtually all current Top 40. That is what NASH Icon and the format split are hoping to change, and so far this new format has been successful where it’s tried. On the rare instance that you do hear an oldie, it’s one of a select few “safe” country classics such as “the gambler” , any Alabama song, “a country boy can survive”, any Ronnie milsap song, “driving my life away”, or “when we get behind closed doors” by Charlie rich. Anyone else notice this phenomenon occurring when your local “country station” plays a “classic”. Wew, I don’t think I’ve ever used that many quotation marks on one paragraph before. Really glad you reviewed this Trig. I bought it the week it came out and you summed it up perfectly. Listening to it gives one a very comfortable feeling, and it’s great to see an Opry stalwart still able to put out something of this caliber. This deserves our recognition and support. What a great album cover. Country music used to have such beautiful, creative album covers. All of the nominal “country” album covers seem to be focused on the singers’ looks. There was even a period of time where almost nobody was smiling on their album covers. The men were making “tough-guy” faces, and the women were making porcupine faces. It is refreshing to know that some things never change. I love the real thing. I just listened to a few samples. I was pleasantly amazed at how it sounds like it was recorded in 1967. The production is beautiful. I may actually spend money on this.